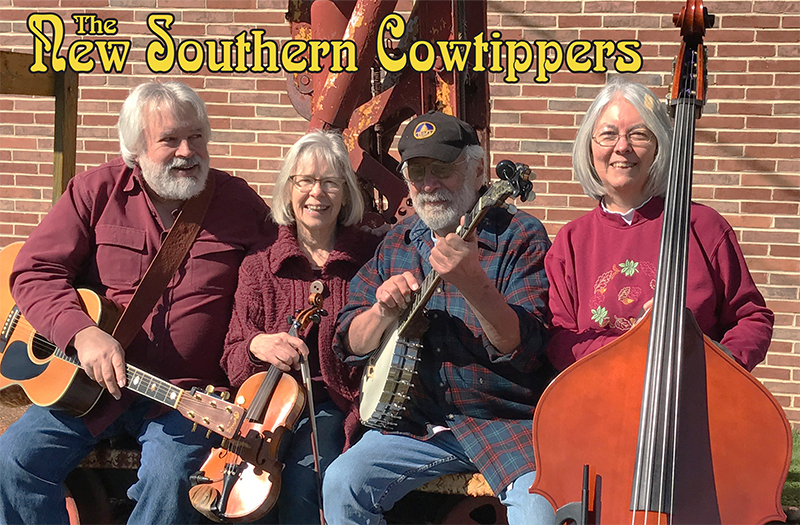 The New Southern Cowtippers reach deep into the musical roots of America. Until the spread of music through the radio, styles tended to be regional. The Old-Time Music we play draws upon Appalachian fiddle tunes and songs from Georgia, Kentucky, North Carolina, Ohio, Pennsylvania, Tennessee, Virginia, and West Virginia; southern blues; pop tunes from the early 1900s; Grand Ole Opry favorites; southern gospel; and an original composition. The musical styles vary depending on the song or tune. The banjo styles range from the ancient thumb-lead to the more modern drop-thumb clawhammer style. Fiddle styles range from the very old rhythmic style of 19th century Kentucky fiddlers to melodic polkas and blues of contemporary fiddlers. Some of these numbers we learned from our mentors and fellow musicians; others we learned from scratchy old 78 RPM recordings from the Library of Congress and record collectors such as Joe Bussard. The Cowtipper name is not original. We borrowed it from a long defunct dance band from New Hampshire popular in the 1930’s and 1940’s. We are not sure of the original name...we think it may have been the White Mountain Cowtippers. No we have never tipped a cow, nor do we even cook them. In recent months the Maryland State lottery has been airing a commercial with two cows ascending a staircase, entering the bedroom and tipping the sleeping occupant. People tipping...We love it!! !